Here are a few images to show how a painting progresses from an initial sketch to the finished artwork. The first stage is to plan out the idea, either as a painting I’d like to do personally or, as in this case, as a commission. I spend many hours planning and researching ideas, subjects and settings to try and come up with something that inspires me to then spend many more hours converting those ideas into a painting. Often it will be a passage in a book, or a picture or video I’ve seen that plants the seed of an idea that then grows into a proper concept. I usually use a combination of photographic reference and CGI to create a compilation which gives me the basic content, composition and lighting. 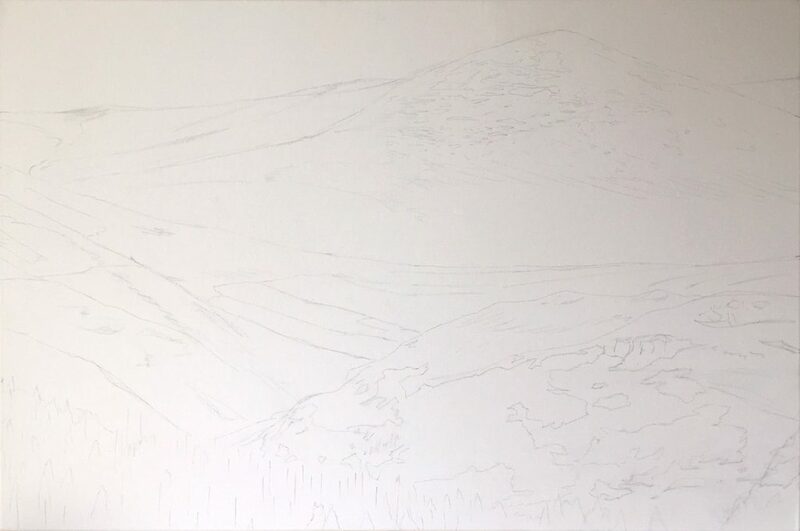 Once I’m happy with the compilation I transfer a rough drawing of the background to the canvas (20 x 30 inches in this case). 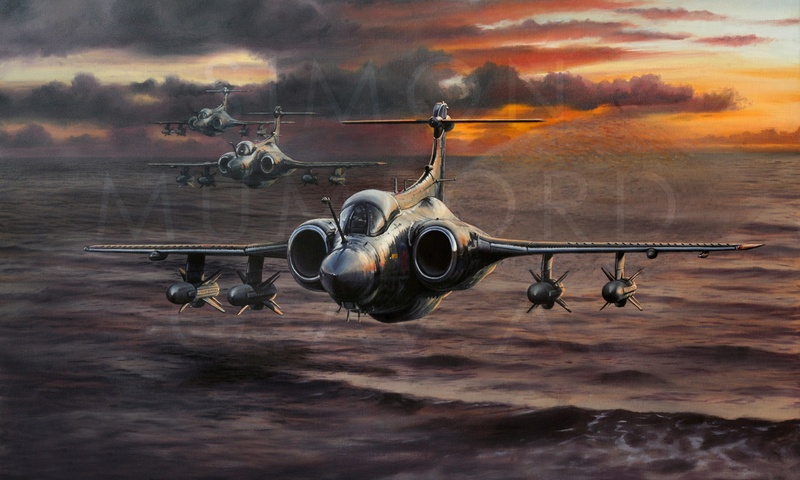 I always paint the background first and then add the aircraft over the top. I know there is some debate about the ‘best’ method but to my mind it’s whatever works for the individual artist. 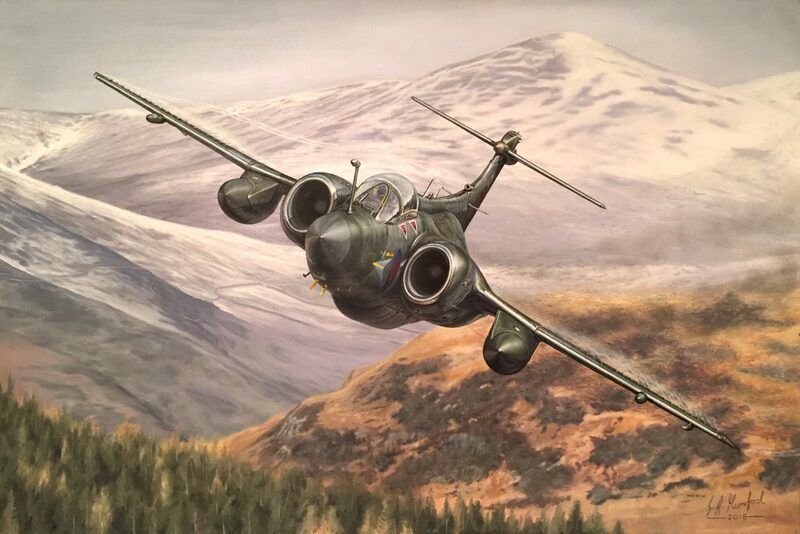 I feel the background can usually be a much looser, artistic part of the painting whereas the aircraft, by its very nature, has to be accurately rendered to look authentic, and needs a little more discipline when applying the paint. Again, not everyone agrees with this, it’s just the way I do it. Painting in the background is usually quite a speedy process, and I try to cover the canvas in one session. As I mentioned before, I feel this helps me to get a more ‘painterly’ organic feel to the image and it’s always a good feeling to cover what can sometimes seem to be a vast expanse of white canvas! 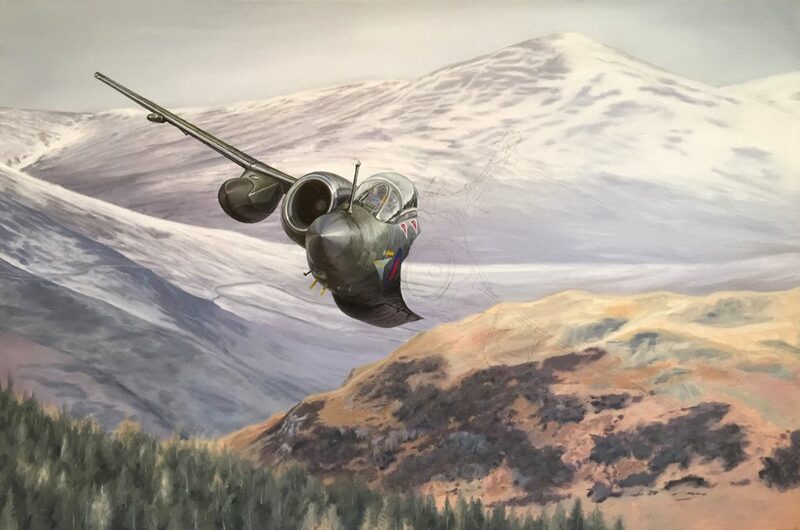 After the background has dried I then transfer an outline of the aircraft onto the canvas taking care at this stage to look out for awkward ‘tangents’ and intersections between the aircraft and the background. At this point some people may see a similarity with ‘painting by numbers’ in that I’m essentially filling in different areas of the subject within the pencil guides. However, I’d like to think it goes a bit beyond that and I personally love this stage when all the hours of work and research involved with getting to this point start to bear fruit as the aircraft begins to emerge from the canvas – there’s something magical about creating the illusion of a 3D object on a 2D surface. Progress continues with one of the key ‘character’ elements of the Buccaneer, the highly polished intake rings. 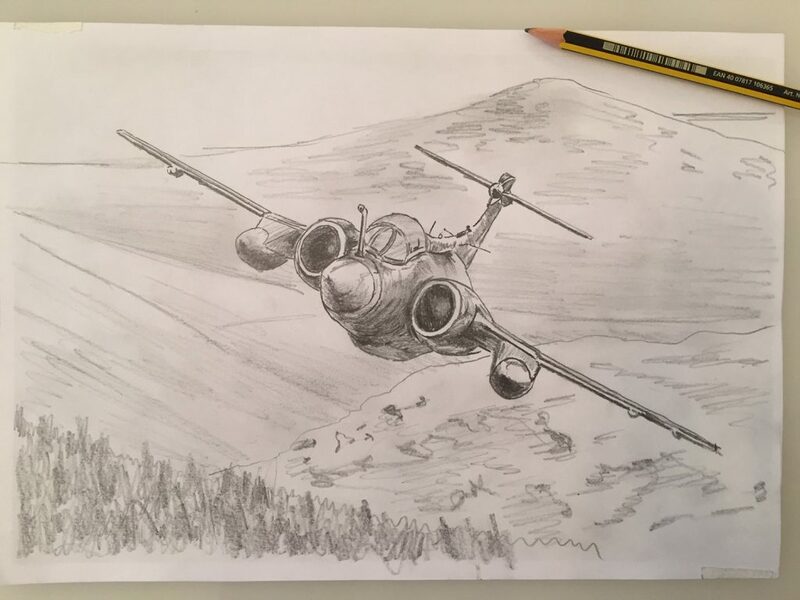 I know a lot of artists like to do a quick ‘block in’ for the first pass and then progressively add detail but I prefer to work slightly differently by rendering the various contours and materials that make up the subject with quite a lot of detail as I work across the aircraft, I think I just like seeing it start to ‘pop’. The first pass is now complete and the painting is probably 90% complete. I have also re-visited the background and changed a few things. The next stage is to go across the aircraft again and add all sorts of extra details as well as improving on highlights/lowlights to lift the image from the background. This probably seems a little superfluous as from a distance the painting essentially looks the same. However, I hope the paintings I create can work on many levels, and can draw in the viewer to the point where they are always discovering new facets and details as they look at the artwork. So I feel the small, subtle details help this process and allow for a greater engagement between viewer and subject. This is the finished painting. The second pass added details like wing vortex generators, lettering and panel lines to the aircraft. 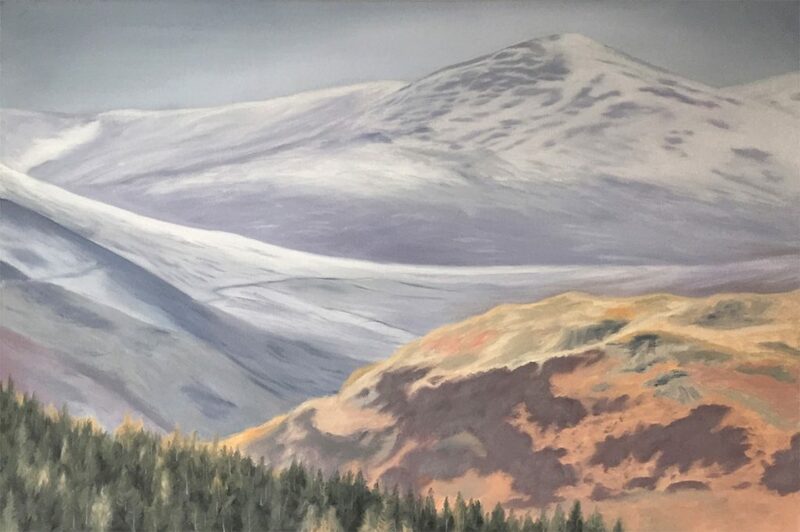 I also use glazes to drop back certain elements – a technique that is particularly useful to ‘push’ a background further back and allow the subject to come forward, enhancing the 3D illusion. 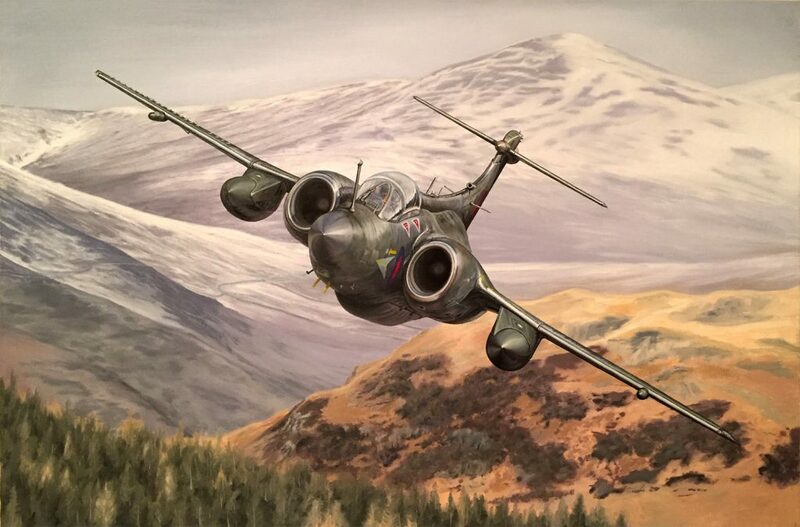 It is then a case of adding things like vapour, wing-tip vortices, subtle smoke trails and jet-wash – or ‘jelly air’ as I call it – to hopefully give an extra sense of speed and dynamics. And that’s it, a signature, varnish and then off to the framers… All in all a painting like this will take about six weeks but I have to say, I enjoy every minute of it. I hope you found this interesting, drop me a line if you have any questions.